Next Article Can Frogs Save Us From Chemicals? The University of Prince Edward Island and the Souris and Area Branch of the PEI Wildlife Federation have received $48,000 from the Atlantic Salmon Conservation Foundation (ASCF) and $7,000 from the PEI Wildlife Conservation Fund for Atlantic salmon research, monitoring, and conservation in three rivers in Eastern PEI. Atlantic salmon have declined on PEI and are only present in 20 of the 70 Island rivers they were once thought to inhabit. 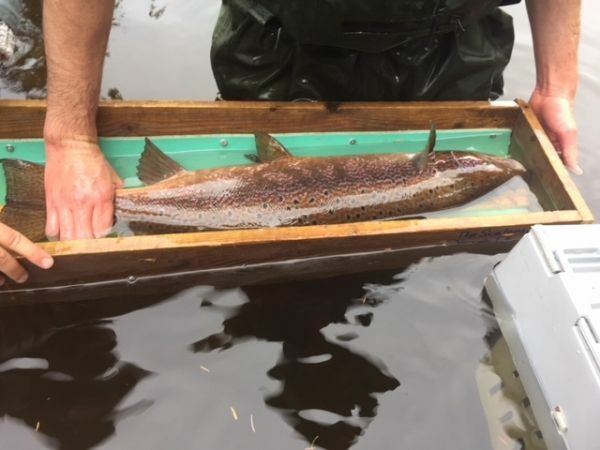 Despite their precarious status in many of those rivers, salmon numbers in Eastern PEI have been increasing due to the efforts of the watershed group. Fred Cheverie, watershed coordinator with the Souris and Area Branch of the PEI Wildlife Federation, has overseen the conservation and restoration measures that have led to these increases in the Souris area. The previous discovery of a unique genetic strain of salmon in two rivers in the region has ignited further interest in research and restoration of these populations. Continue reading at University of Prince Edward Island. Image via University of Prince Edward Island.